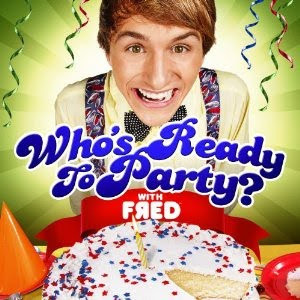 Discussions Magazine Music Blog: FRED FIGGLEHORN/Who's Ready To Party? : The album available September 21st, 2010. FRED FIGGLEHORN/Who's Ready To Party? : The album available September 21st, 2010. The YouTube sensation goes from the internet to the airwaves with his Who's Ready To Party? album and Nickelodeon feature film Fred: The Movie. Huge teen and tween sensation, Fred has dominated the digital world for more than three years with over 500 million views making him the #2 All Time subscribed YouTube channel. Album release coincides with the world premier of the Nickelodeon original feature length film Fred: The Movie.